State ratifies South Salt Lake location McAdams chose; the road ahead will be a difficult one, advocates say. 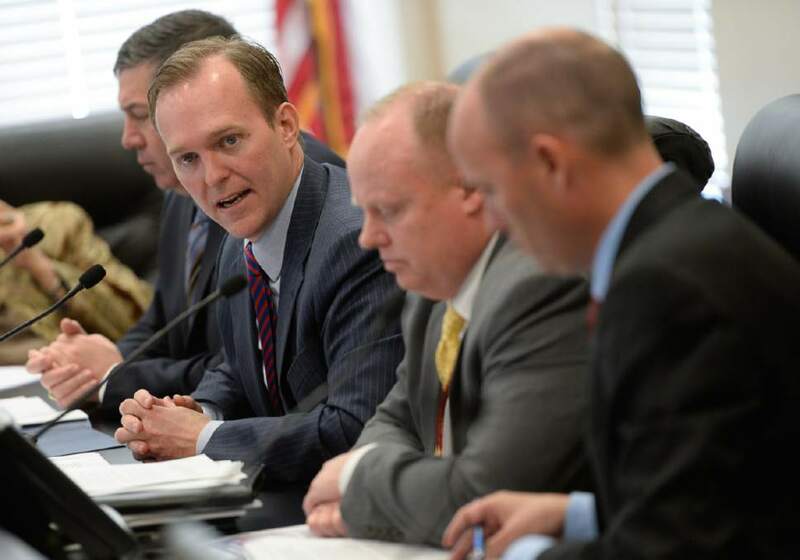 Francisco Kjolseth | The Salt Lake Tribune State Homeless Coordinating Committee meets to ratify decision of Salt Lake County Mayor Ben McAdams, second from left, to put the the one non-Salt Lake City homeless resource center in South Salt Lake at 3380 So. 1000 West. The group gathered at the Capitol Complex on Monday, April 10, 2017. Francisco Kjolseth | The Salt Lake Tribune South Salt Lake resident Brad Holscher expresses his objection to a new homeless site as the State Homeless Coordinating Committee meets to ratify decision of Salt Lake County Mayor Ben McAdams to put the the one non-Salt Lake City homeless resource center in South Salt Lake at 3380 So. 1000 West. The group gathered at the Capitol Complex on Monday, April 10, 2017. Francisco Kjolseth | The Salt Lake Tribune Homeless advocate Pamela Atkinson overlooks the homeless bill HB441 as the State Homeless Coordinating Committee meets to ratify decision of Salt Lake County Mayor Ben McAdams to put the the one non-Salt Lake City homeless resource center in South Salt Lake at 3380 So. 1000 West. The group gathered at the Capitol Complex on Monday, April 10, 2017. 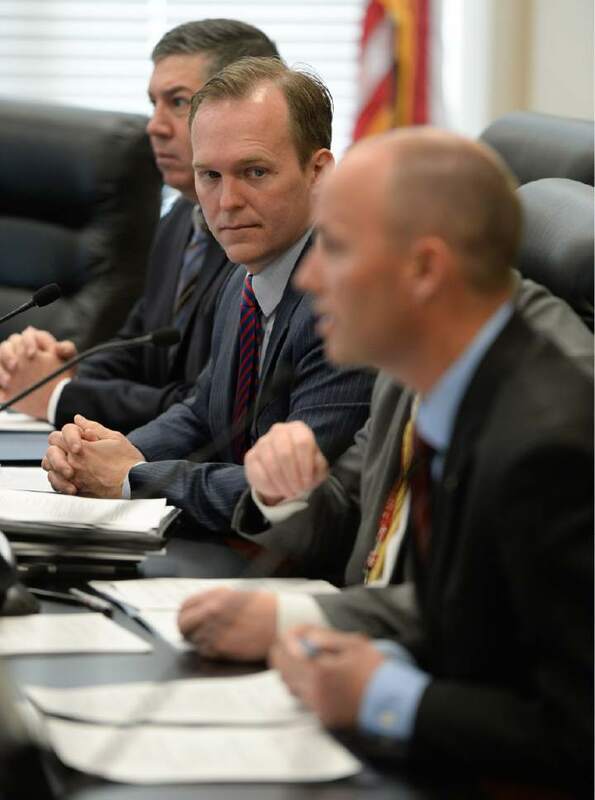 Francisco Kjolseth | The Salt Lake Tribune State Homeless Coordinating Committee meets to ratify decision of Salt Lake County Mayor Ben McAdams, left, to put the the one non-Salt Lake City homeless resource center in South Salt Lake at 3380 So. 1000 West. The group gathered at the Capitol Complex on Monday, April 10, 2017. 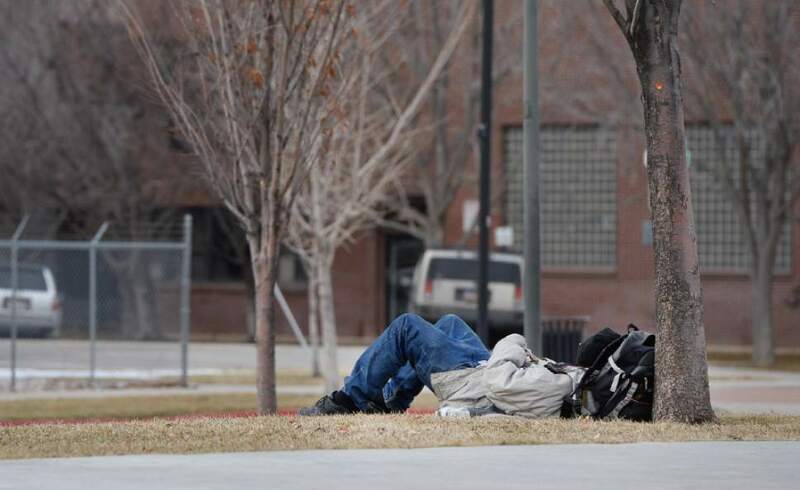 Francisco Kjolseth | Tribune file photo A state committee has ratified the county decision to site a new homeless resource center in South Salt Lake. Francisco Kjolseth | The Salt Lake Tribune Lt. Gov. 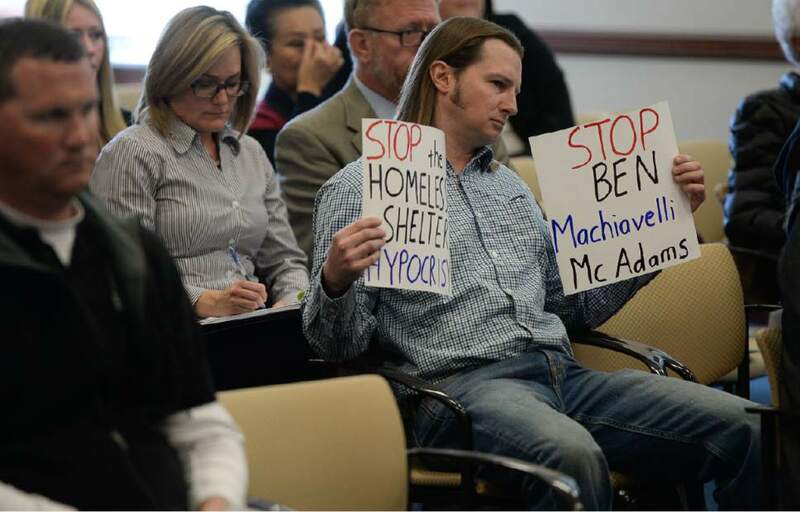 Spencer Cox, right, leads the State Homeless Coordinating Committee as they meet to ratify decision of Salt Lake County Mayor Ben McAdams, top center, to put the the one non-Salt Lake City homeless resource center in South Salt Lake at 3380 So. 1000 West. The group gathered at the Capitol Complex on Monday, April 10, 2017. Francisco Kjolseth | The Salt Lake Tribune Lt. Gov. Spencer Cox, right, leads the State Homeless Coordinating Committee as they meet to ratify decision of Salt Lake County Mayor Ben McAdams to put the the one non-Salt Lake City homeless resource center in South Salt Lake at 3380 So. 1000 West. The group gathered at the Capitol Complex on Monday, April 10, 2017. 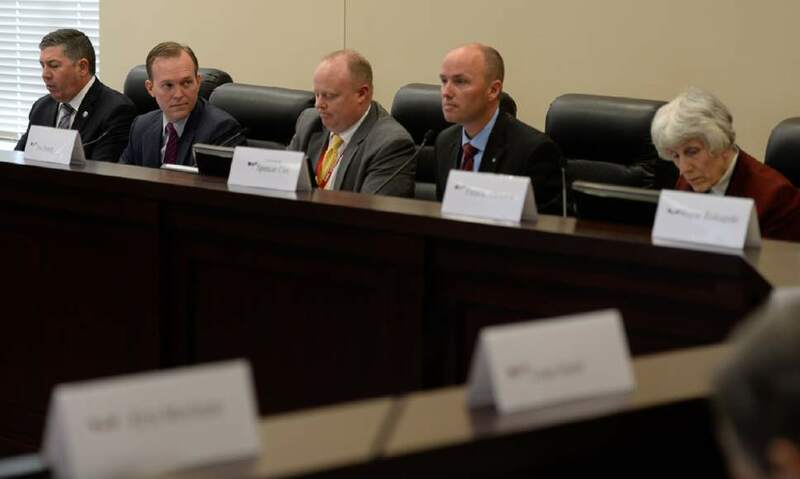 Francisco Kjolseth | The Salt Lake Tribune State Homeless Coordinating Committee meets to ratify decision of Salt Lake County Mayor Ben McAdams, second from left, to put the the one non-Salt Lake City homeless resource center in South Salt Lake at 3380 So. 1000 West. The group gathered at the Capitol Complex on Monday, April 10, 2017. With a homelessness committee&apos;s decision Monday to move forward on a plan to split an existing large homeless shelter downtown into three smaller, scattered sites, the attention of state and local leaders will now turn to work yet to be done. Without debate and with only one dissenting vote, the state Homeless Coordinating Committee approved a proposal for a center of up to 300 beds at 3380 South 1000 West in South Salt Lake. Two earlier announced 200-bed centers will be in Salt Lake City at 131 East 700 South, an existing Deseret Industries thrift store, and at 275 W. High Ave. (1400 South). Ratification of the South Salt Lake location caps six weeks of work and contentious meetings organized by Salt Lake County Mayor Ben McAdams. But it marks the beginning of more work that groups providing help to homeless residents say will be fast-paced and difficult. "We&apos;ve talked about setting up a new model," said Bill Tibbitts, associate director at Crossroads Urban Center. "A lot of the details of that new model are not fleshed out enough." Under the reform effort, the existing 1,100-bed shelter at The Road Home will close and three new sites are scheduled to open by June 30, 2019. The committee approval Monday means the county can soon begin talking to architectural firms about designs for the center. It&apos;s still undecided which site will hold both men and women, which will hold single women and which will hold single men  the biggest group of homeless people in the area that residents fear would bring crime. "I don&apos;t even know what population they&apos;re looking at for South Salt Lake; I would hope that it might be the single women," said Midvale Mayor JoAnn Seghini, the lone vote against locating a site in South Salt Lake . "I think they&apos;re on the whole less aggressive. As I work with our families, it&apos;s the guys that give us trouble." Midvale currently is host to a 300-bed shelter for families. McAdams says the distance of the South Salt Lake center from downtown and lack of other resources in the immediate vicinity makes the site a good fit for low-needs residents. He said during deliberation about the site March 30 that the largest number of low-needs people were "probably working men." It&apos;s unclear where higher-needs residents will reside and whether existing downtown facilities will move to provide care like food and clothing. "We don&apos;t know what populations would go where or what it would look like," said Danielle Stamos, spokeswoman with Catholic Community Services, which operates St. Vincent de Paul kitchen and the Weigand Homeless Resource Center. "Our general concern is that everyone has access to the programs they need." In emails obtained by The Tribune, county employees said the plan was to close St. Vincent de Paul and Weigand, which providers said was news to them. Also left to be resolved , which McAdams said the state should tackle "in the coming months," are a string of single family houses next door to the future center in one of the last undeveloped sections of South Salt Lake. The committee backed McAdams&apos; call to recommend the state buy neighboring properties. Homeowners on 1000 West said McAdams had personally knocked on their doors and assured that homeowners would be compensated. "We&apos;ll see what properties are available and make that determination also in the next couple months," McAdams said Monday. "The budget for land acquisition is somewhere between $2 million to $3 million." The budget for buying the vacant land in South Salt Lake is $800,000, leaving over $1 million to $2 million to buy nearby properties if the state agrees with that approach. That would be welcome news for Bob Slingerland, who represents the owner of Good Spirits, a bar located a 3300 South 999 West, a short walk from the future shelter. The bar is kept in a trust that benefits a widow who relies on the income, Slingerland said, and it is for sale with several interested buyers. "Now nobody wants to touch it with a 10-foot pole," he said. The committee also left work for lawmakers to do before construction begins. After voting to approve McAdams&apos; proposal, the committee unanimously approved a motion to delay groundbreaking until the Legislature passes a bill directing more funding to cities that host homeless resource centers. Rep. Steve Eliason, R-Sandy, made that proposal last session but it failed to pass. McAdams said Monday he spoke with House Speaker Greg Hughes, who was open to passing the bill in 2018. 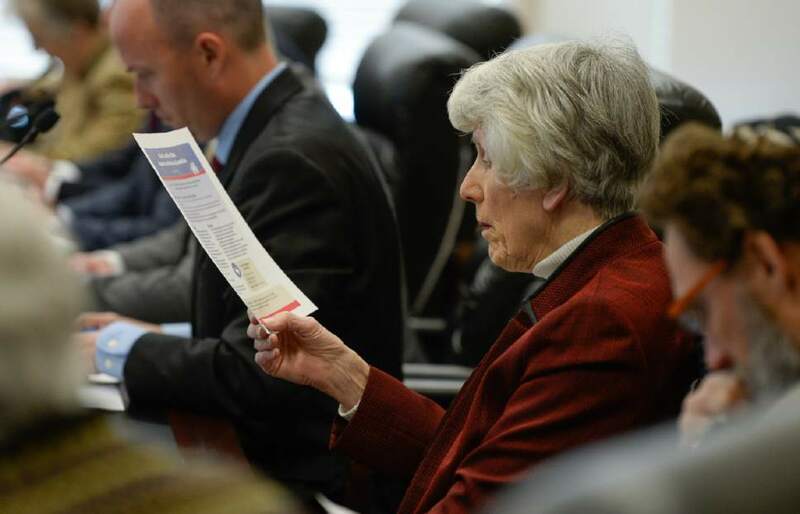 South Salt Lake Mayor Cherie Wood attended the meeting Monday, asking the committee to pick a different city. 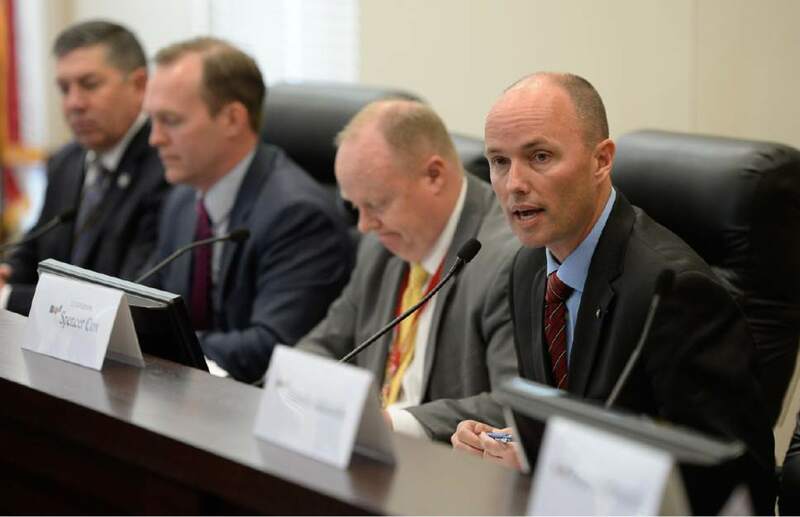 "I&apos;ve said it before and I&apos;ll say it again: South Salt Lake has all of the facilities that no one wants and none of the County facilities that everyone wants," Wood said. 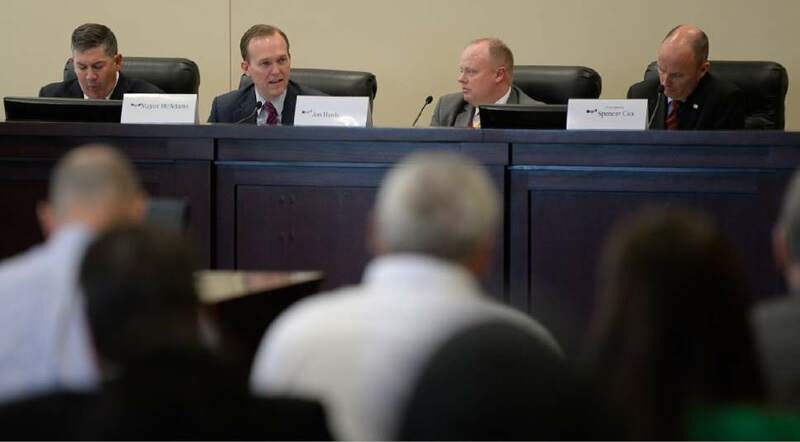 That may change if Salt Lake County and lawmakers agree with McAdams&apos; call to build a new public library in South Salt Lake and focus more transit investments there in the future. "Being part of the urban core... there are both opportunities and responsibilities," McAdams said Monday. "I think South Salt Lake is shouldering their share and more of those responsibilities… but maybe some of those opportunities should also follow." Under HB441, $20 million in state funding is committed to the three-center project, along with authority to override zoning or other obstacles that may be placed in the way of the project by local leaders. Material distributed at Monday&apos;s meeting said the next step was for the board of the nonprofit Shelter the Homeless, which will own the three new facilities, to develop a proposal that would "meet the needs of the region&apos;s homeless populations at the three approved sites." The state Homeless Coordinating Committee would then vote on that proposal at a future meeting and vote on releasing the appropriated funds for the three sites. That creates more questions for Tibbitts. "There&apos;s a lot of uncertainty among the people who provide homeless services about how it&apos;s going to work," he said. "There&apos;s just a lot of decisions that need to be made."